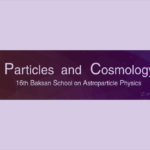 The aim of the School is to cover topics in both experimental and theoretical astroparticle physics. 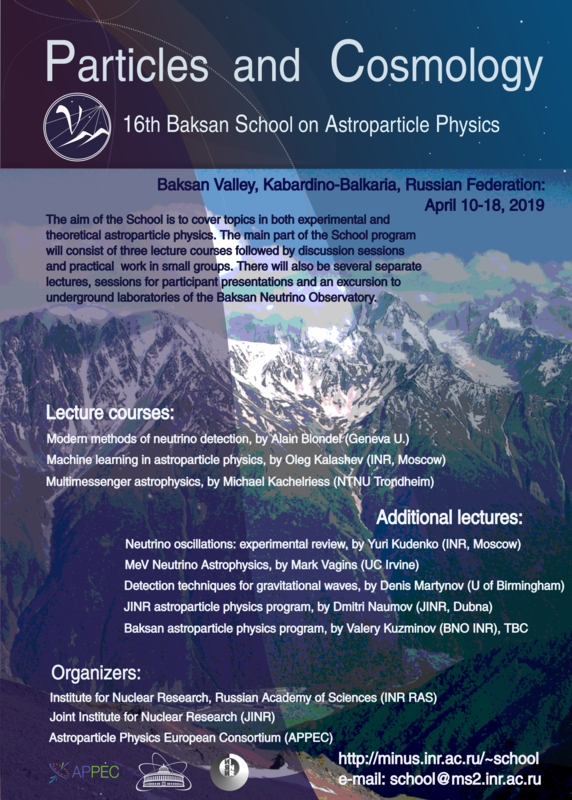 The program of the school will include three main lecture courses followed by tutorials, practical and discussion sessions, together with several separate lectures, special session for participants presentations and excursion to underground laboratories of the Baksan Neutrino Observatory. The School is addressed to advanced masters students, graduate students and postdocs working in astroparticle physics. * Three 6-lecture courses by leading experts (neutrino detection, machine learning, multimessenger astrophysics), supplemented by tutorials, practical work, more lectures and participants’ talks. * Excursion to Baksan Neutrino Observatory underground labs (4800 mwe). * Location in a national park close to Mt. Elbrus (5642), one of the “Seven Summits” of the World, with possibilities for skiing and hiking during long mid-day breaks. * Low registration fee (325 EUR including full-board lodging, airport transfer, banquet and excursion) and fellowships covering the fee. More information on the School website http://www.inr.ac.ru/~school.